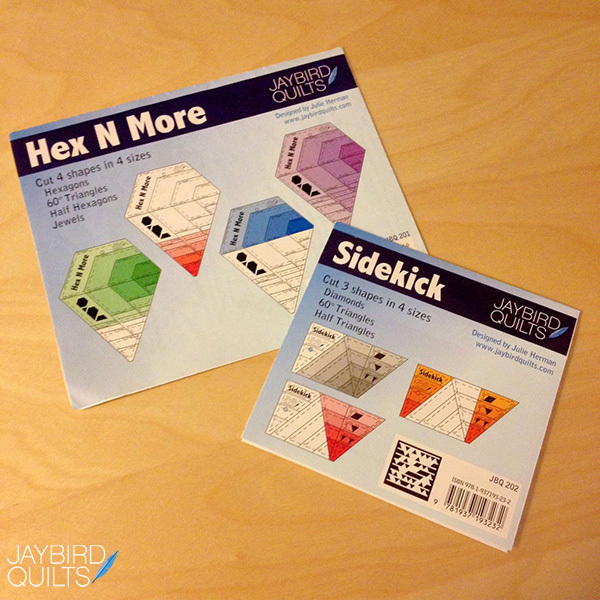 I’m Julie of Jaybird Quilts the designer behind the Hex N More and Sidekick Rulers. Today I’m here to tell you a bit more about my rulers. I released the Hex N More last year and just released the Sidekick one month ago. 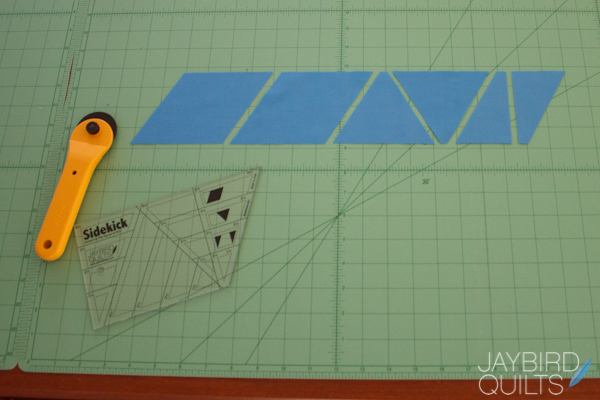 The two rulers allow you to rotary cut a variety of shapes from strips for fast & fun quiltmaking. They can work independently or as a pair. 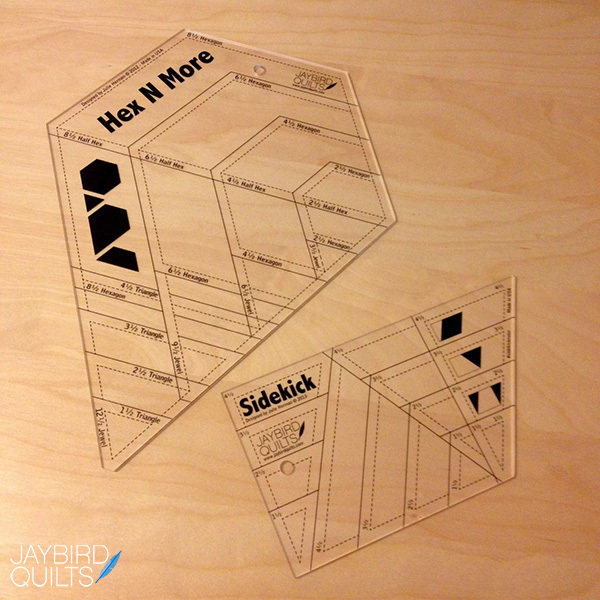 The Hex N More cuts 4 shapes in 4 sizes. Hexagons, Triangles, Half Hexagons and Jewels. 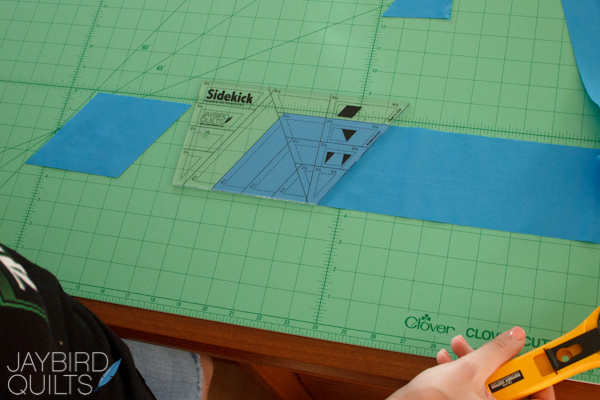 The Sidekick cuts 3 shapes in 4 sizes. Triangles, Half Triangles and Diamonds. 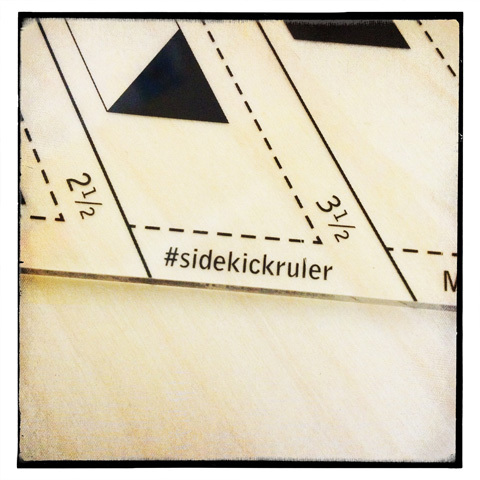 The Sidekick Ruler also has its own hashtag printed directly on the ruler. Here is a screen shots from Instagram on my iPhone of #SidekickRuler. 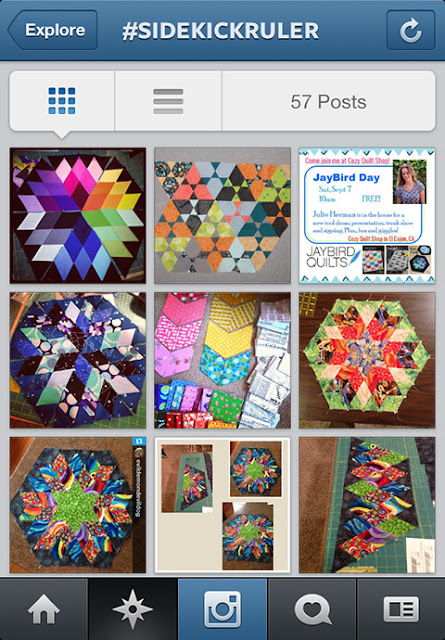 I love seeing what quilters make with my rulers and patterns & hashtags make it so easy to follow along! Both rulers come with full color instructions just like my patterns. Currently I have designed 10 patterns using the Hex N More. 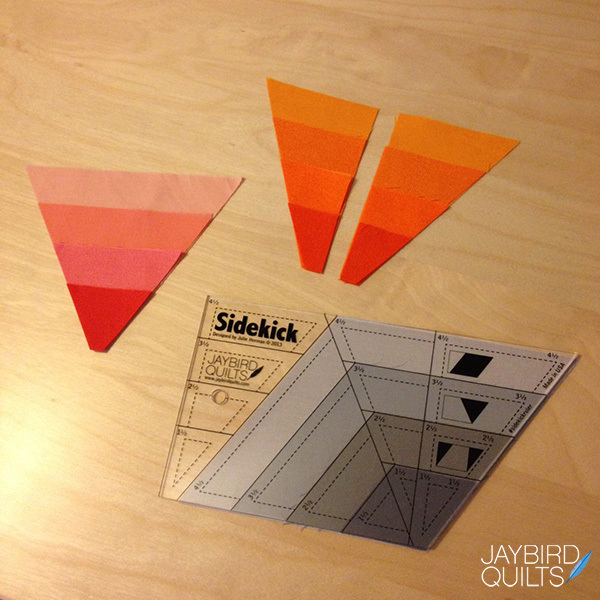 Currently I have designed 3 patterns with the brand new Sidekick Ruler. I also have a few new patterns in the works that will be released at fall quilt market using the Hex N More and Sidekick Rulers!! 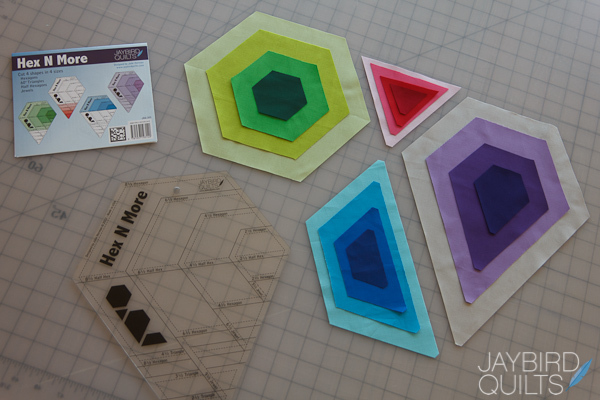 Last year I showed how to cut a Hexagon with the Hex N More. 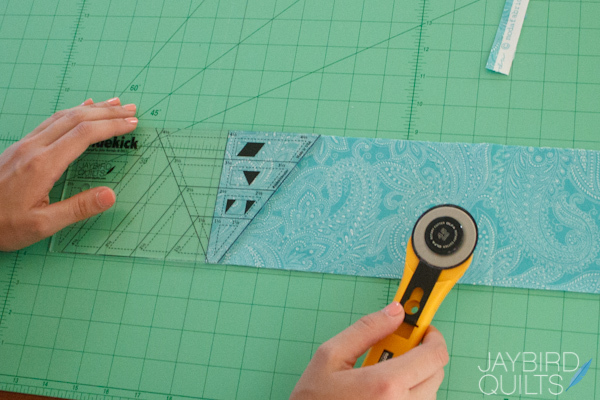 Today I’m going to show you how you can cut Triangles, Half Triangles and Diamonds all from one strip of fabric with the Sidekick Ruler. 1. I started with a 3 1/2″ x WOF strip. 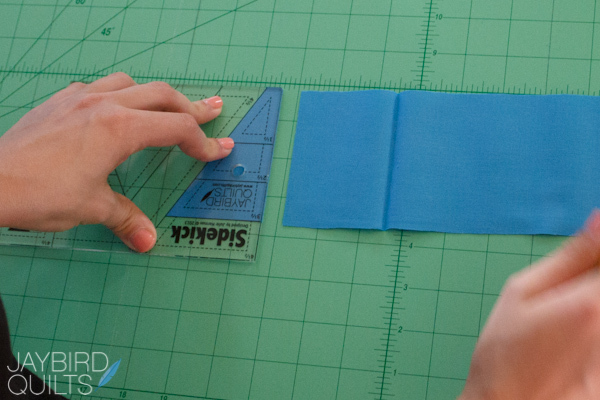 Align the Sidekick Ruler as shown and trim fabric on the right to create an angled cut. 2. 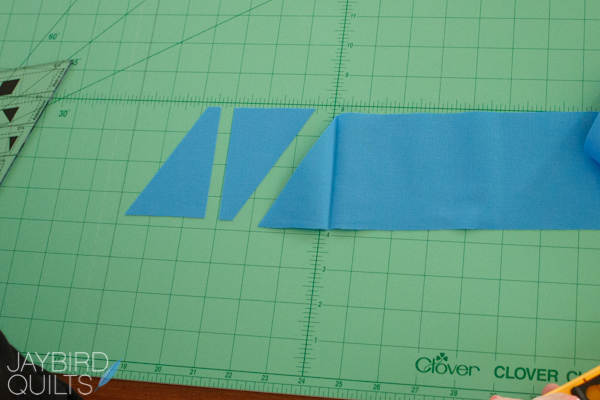 Rotate fabric strip 180° and align ruler as shown. Cut on right side to get a diamond. 3. Continue working your way down the strip cutting diamonds with no waste. 4. Next up is the Triangle. Flip the ruler towards you and align as shown. Cut to create a triangle. 5. 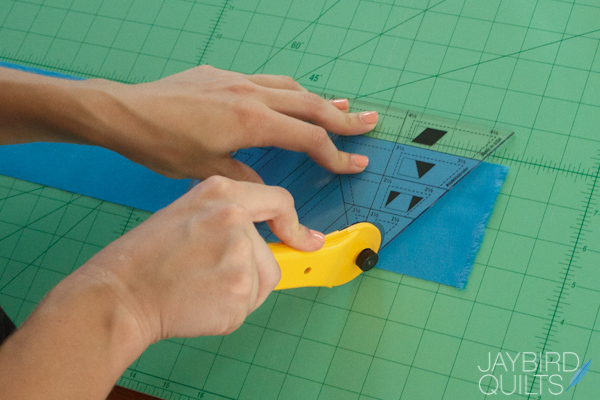 Flip the ruler back up to cut the next triangle. 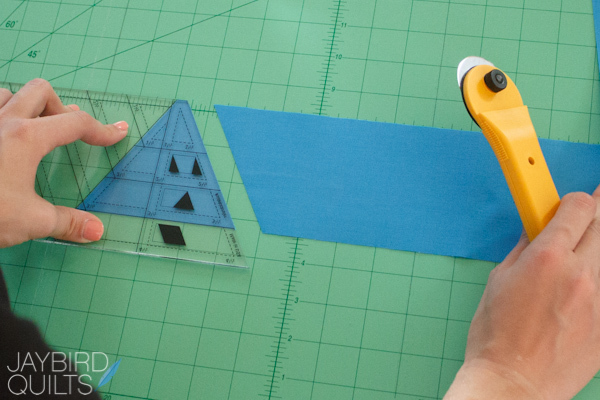 Repeat to cut as many triangles as you need. 6. Last is the Half Triangle. 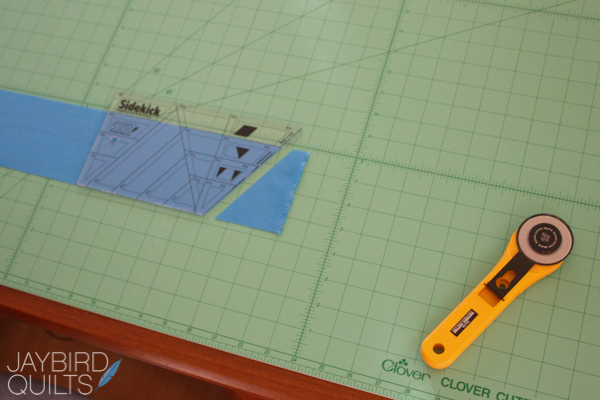 Align the ruler as shown and cut to create a Half Triangle. 7. Rotate the ruler back 180° to continue cutting half triangles. 8. The result is all 3 shapes from one strip. 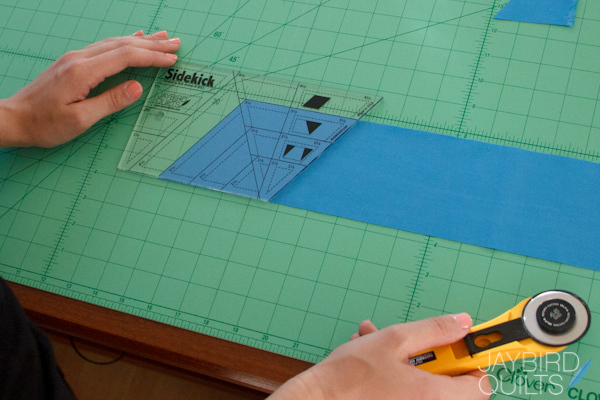 The Sidekick can cut shapes with 1″, 2″, 3″ & 4″ finished heights. 9. 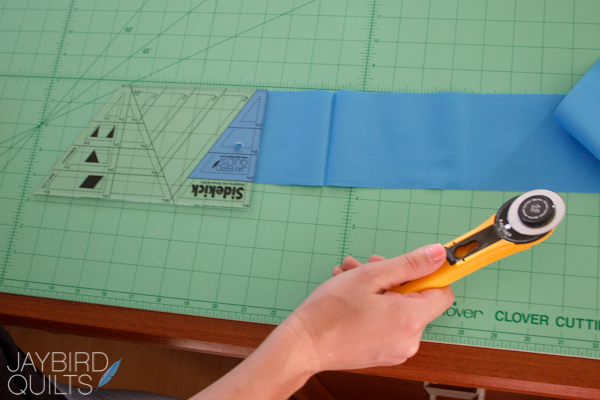 To cut left & right half triangles at the same time you will want to start with two layers of fabric wrong sides together. 10. Square off the edge and remove the selvages. 11. 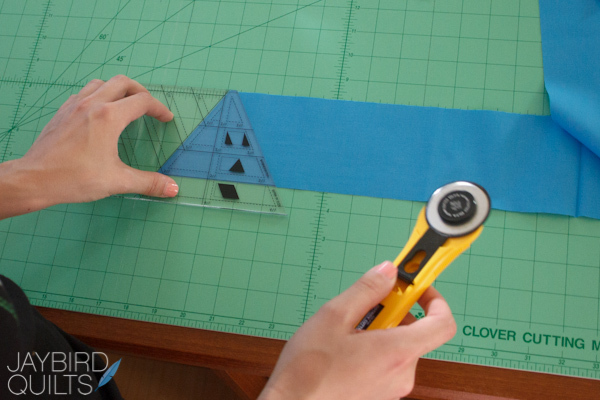 Rotate the fabric strip 180° and align the ruler as shown. 12. Cut along the right side to create and left and right half triangle. 13. 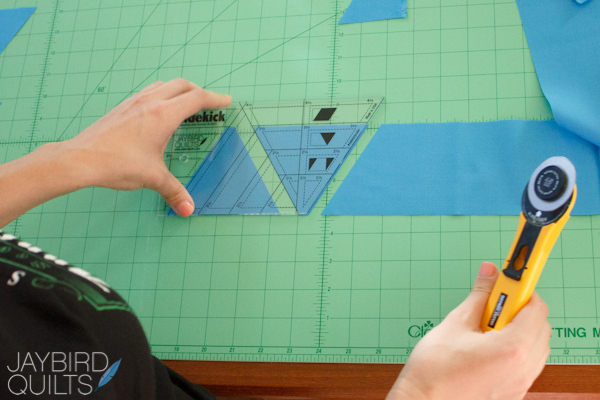 The result is that each cut creates mirror image half triangles. I’m excited to share my new patterns with you soon at Fall International Quilt Market! We will be giving away a Hex N More Ruler and a Sidekick Ruler to one lucky winner! To enter please leave a comment—tell us which of the Hex N More or Sidekick patterns above is your favorite and why. You will have until September 30 at midnight to comment. All winners will be randomly selected and announced on Moda…The Cutting Table Blog on October 2. Make sure to visit the blog every day for the opportunity to win each giveaway! Next Next post: TrueCut Keeps You Cutting Straight! I love Snacktime. The colors in the pattern are great, but this design would look good in many different fabrics. Absolutely love the Science Fair pattern! It is so fun and looks great in all kinds of colors. I like Toes in the Sand. I love anything to do with the beach! I love the WonTon, I’m not sure why, it just popped out at me and I keep going back to it. I love Science Fair ! 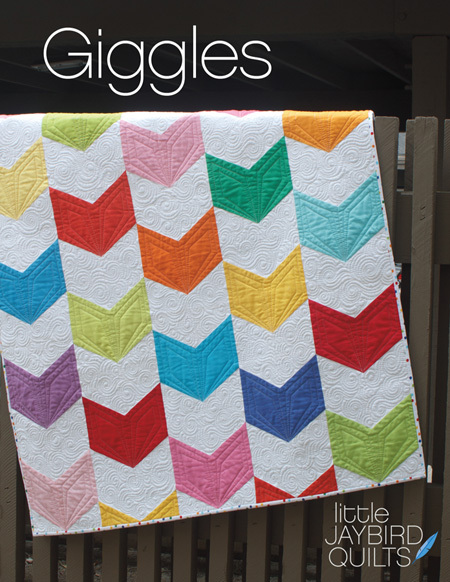 Love Giggles – one of the cutest quilts and always makes me smile. All of Julie’s patterns are great! I’m lovin’ the Hex and More ruler. Once I saw a few of the patterns (Rock Candy & Candy Dish in particular), I realized that this ruler is almost essential in a quilter’s collection. Science Fair is a fun quilt. Lots of possibilities with colors. I also like the Candy Dish pillows. So cute! The Candy Dish pillow is my favorite. Love the rulers, too. Thanks for sharing. Love Northern Lights! I live in Morthern Michigan where they are absolutely beautiful. The quilt/pattern is georgous and would make a great way to allow me to see them daily. I love Rock Candy because it reminds me of my childhood and summer vacations. We always seemed to go somewhere fun that sold rock candy. That was my favorite thing to get because I didn’t get it at home. I have your hex n more ruler and just love it. Would love to have the Sidekick too. My favorite pattern is Tiny Dancer. I just love how it flows together. I love those rulers! So useful! And, because I used to teach science, my favorite pattern is Science Fair. OH! I want to learn to use these rulers. I love Toes in the Sand – it looks very intriguing to make and it turned out beautiful! I have seen the hex ruler before but did not realize how it worked. Thanks for the tutorial! Northern Lights is my favorite, since I come from a part of the world where N.L. brightens up the night sky at winter time. I like how Candy Dish has the two variations with the use of light and dark fabrics. My favorite Hex-n-More pattern is Snack Time. My favorite Sidekick pattern (love love love this one) is Rock Candy. I want to try that one in Christmas colors. Rock candy is my favorite, it’s looks like a star radiating outward. Love it! I love Toes in the Sand – it really plays with the variety you can create with the Hex-N-More ruler. LOVE this ruler – can’t wait to get the Sidekick! I have to pick just one? Fine. Science Fair. I like the negative space. I love Science Fair, it is simple and stunning at the same time. I also like that you get to see it made up in 2 different colourways. Thanks for an amazing giveaway. Crossing fingers and toes for this one. Why do I have to pick just one? They are all so pretty. My choice would be Lotus. I saw Julie’s actual samples recently and love the pattern. I HAVE ENJOYED Science Fair and Sand In Your Toes is my fave! I like Tiny Dancer. Thanks for the chance to win. I love the patterns. Lots of wish list items! Toes in the Sand was on display this summer in Sisters, Oregon at their local fabric store. It is a great quilt. But I think if I had to choose it would be Tiny Dancer. You’ve captured so much movement in this design. Wow! So much gorgeousness right here! My fav is the Seaside! I like Northern Lights. It has great movement and is very unique. I like Rock Candy the most for its lovely colors and interesting pattern. I like the toes in the sand pattern. you for the chance to win. I like candy dish, science fair, toes in the sand… They are all pretty great! Science Fair is my favorite. Like the asymmetry and all the negative space for quilting. I really like Candy Dish! I love the modern feel to it and the design of the pattern! Thank you for the chance! I’ve not seen either ruler but I can sure see the value of the Sidekick. I love these rulers and they really need to be I’m tool box. My favorite pattern is the Candy dish. Love how different it looks when the lights and darks are switched. I like Snack time! I love the colours you used and the negative space! Northern Lights. I like that is looks very modern. I like the Lotus quilt. Beautiful quilting and piecing. I love your Giggles pattern. 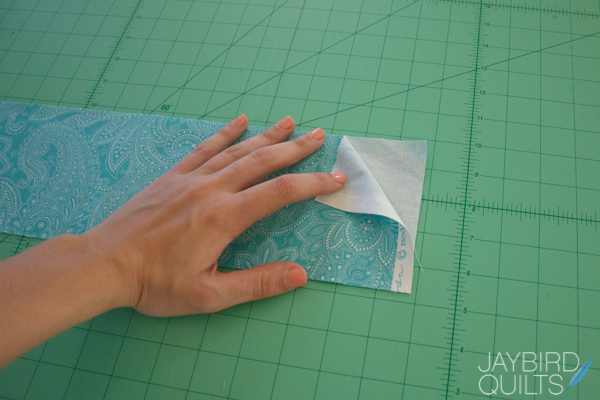 It is perfect for making quilts for little ones! I just love Rock Candy they are so colorful and pretty. I could see these all over the house on tables, dressers, you name it. They would also be great gifts. Sure hope I win cause I have 2 quilts to make that I need both these rulers for diamonds Hexis and triangles. Seaside!!! And love the Sidekick! Thanks for all your talent. I like the Lotus pattern – you can highlight one or two large scale prints and the triangles can coordinate to that. I like the large blocks also. Thanks for the give away! I love science fair and candy dish. thank you for a chance to win. thank you for the tutorial. I love toes in the sand. . although tiny dancer is a close second. Love how the fabric can play within these designs. Just one? No No No, give me Lotus, tiny dancer and seaside. I am currently doing the toes in the sand BOM and love it, the fabric choices for this from the fat quarter shop are perfect. All your designs are absolutely visually stimulating, but Jawbreaker is probably one that I’ve been drooling over for the longest time. Right now, I would have to say “Giggles”. Who wouldn’t want their quilt smiling at the recipient! I really like the Northern Lights because of it’s bold simplicity. I’d like it in warm colors too, like fire and lightning. Thanks for the giveaways! i love my hex and more ruler, and the new one looks fun too. i’m really liking Toes in the Sand and am building up the fabrics to make the quilt. I love the Science Fair pattern! So modern and fun! My favorite is Tiny Dancer. The design just dances! I like Science Fair because of all that interesting negative space. But they all look excellent! All are fabulous.Only one? Science Fair . My favorite pattern is Candy Dish. When I look at the stars it makes, I think of Christmas. My favorite time of the year! I love Rock Candy….remind me of my mom who used to make our won candy! They are all great, but Snack Time is my favorite. It would look great with a variety of fabrics themes. Both rulers are wonderful. My favorite pattern is the Science is Fun? I have the Hex n More ruler but haven’t used it yet. More incentive to try it, thanks. Rock Candy. I just love the color comb! CandyDishis my favourite pattern- though Wonton is a very close second choice. I love the new Giggles pattern. Awesome rulers. Thanks for the chance. I love Rock Candy..I like the colors and absolutely love anything with a black background. Your ruler makes it look so easy. Thank you for sharing. Lotus is wonderful–the blocks have great impact, and I can imagine the different “personalities” that different fabrics would bring. My favorite is Lotus, it has a wonderful secondary pattern. Thanks a bunch for a chance to win your awesome giveaway! Snack time and science fair are my favorites. I like Science Fair. It’s a fun spin on the traditional Flower Garden. My favorite is Snack Time because it looks so happy and fun! Man! What a tough question!!! I guess if I could only pick one it would be Toes in the Sand. I see it as a BOM and great teaching quilt. I like Northern Lights too because it’s so wonky and has interesting movement. Then there’s Tiny Dancer. I like that one because it has that tessalation feel and I love tessalating designs. Would love to win a set of your rulers to play with :-). I like the Snack Time. So pretty. Tiny Dancer – I love those dancing dark triangle! Thank you for the chance to win these wonderful rulers!!! I love Toes in the Sand. The colors in yours plus what seems to be an endless array of possibilities within each of the “toes” are inspiring. I needed these rulers last week…maybe I wouldn’t have wasted 10 FQs 🙁 oh well… Live and learn as they say! Loving all those patterns but my favorite is Giggles!!! I love Rock Candy! I can just picture it made up in Christmas colors and used as a table topper! I love my hex n more ruler. I made Tiny Dancer for a friend’s new baby, and then used the extra strips left over to make a table runner, using six half hexagons to make each of the three hexagons. Turned out great! I like the intracacy of Toes in the Sand, but it was hard to pick just one favorite! Rock Candy would be my choice with the SideKick ruler. I love the hex shape and I would make it in bright solids or a Christmas print. Love Tiny Dancers as well. Too many choices! Great giveaway and thanks. I am about the most “traditional” person you will probably meet – but I would definitely give “modern quilting” a whirl if I won these rulers! Candy Dish is one of my favorite patterns and I would love to make it! Thanks for the chance to win! I love tiny dancer. Reminds me of snowflakes. I like Tiny Dancer the best–love the spinning effect! 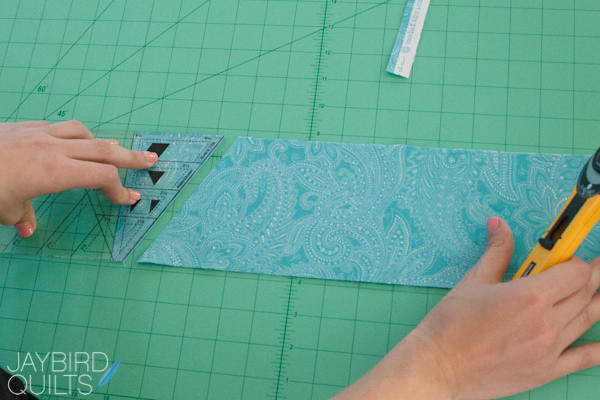 I can see that I will need to get these rulers–so many possibilities! Lotus is my favorite….can’t really say why…maybe I’m intrigued with the way the pieces fit together. I really like snack time the colours are just so lovely. All of the patterns are beautiful, but if I had to pick just one it would be Wonton. To be honest, I would like to try them all! These are all such nice patterns it is hard to choose but I keep going back to the Northern Lights as I like that zig zag look and the use of solid colors. Great rulers! Hope my Quilt shop gets them soon. I like Seaside for the movement! Love Northern Lights – the colors are right up my alley. I really like the Jawbreaker pattern as I like anything with hexagons, especially big ones. Rock Candy is very striking and Science Fair is just fun. It’s hard to choose between the two looks. The Wonton, Lotus and Candy Dish pillows are my favorites. I’ve been looking for a quilt that would appeal to my 16 year old granddaughter. I’ve been doing so much with reproduction fabric the past couple years and she is not into history at this point in life. I’ve got to get your rulers, I hope I’m the winner. My favourite is Rock Candy. The size is very ‘doable’ and would make great gifts. It’s unusual, but I think it would appeal to everyone. I think the Hex N More ruler is my favorite because I absolutely love the Tasty Table Runner!! Toes in the Sand … my all time favorite design … in PB&J! I really love Seaside. Diamonds always look like you did a lot of work. Hopefully the ruler makes it easier. I’m torn between Northern Lights and Snack Time. I like the rainbow effect in Northern Lights–and I also like the contrast between white and bright colors in Snack Time. I love snack time especially the bright fun colours! I have admired both these rulers for some time but I especially LOVE the Sidekick Ruler. It has so many possibilities.My favorite pattern would be Tiny Dancer. I have admired the jawbreaker pillow for a while, but candy dish keeps popping up on Pinterest. I also like science fair. HELLO,love “Rock Candy” for its shape and beauty and want to make it soon! Science Fair! 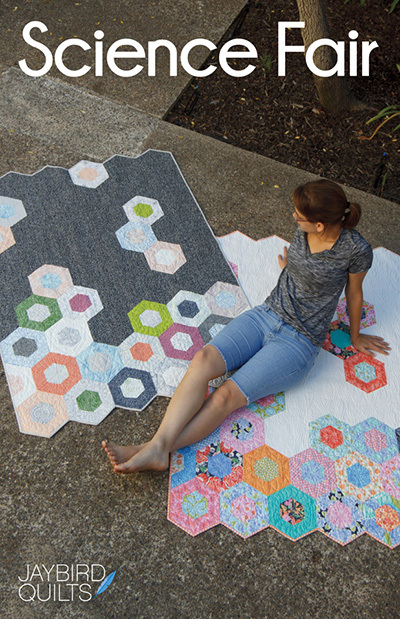 I want to make my granddaughter a honey bee quilt and these hexagons would be the BEST! Rock candy is so cute! “Snack Time” is my favorite pattern, it’s just so cheery! By the way, I love your Hex N More ruler! I just used it for making the shapes of the foliage of the trees I’m making for blocks. So handy for so many things. Thank you! Rock Candy is my favorite. I would do it in the colors shown.They are awesome. I love the pillow jawbreaker and the pretty table runner, Tasty is on my wish list. Another great ruler. All the patterns are great. 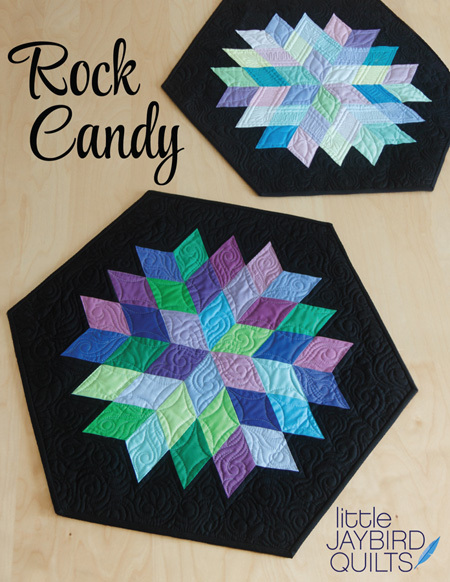 I love Rock Candy….I want to make a quilt for my bed with this pattern!! Thanks for the chance to win!! I’d say Science Fair as I haven’t seen anything quite like this – very original, I thought. I think Giggles would be fun to make. I’ve been admiring chevron patterns lately. How can I choose just one? I want to make them all! I like the different options you can do with the rulers. I no longer buy things that are a single use ruler. Good product. I really like Science Fair because of the asymmetrical look to it, and the hexagons of course. I love Giggles. Ya wanna know why? It’s my blogging moniker! I absolutely love Tiny Dancer because of all the movement in the quilt. Really impactful! Julie’s patterns are understandable, accurate and clearly written and illustrated. I so appreciate her efforts! And her rulers make it so easy – thanks Julie! Love tiny dancer with the non traditional edge! I like the Science Fair because of it abstractness…. Giggles is my favorite. They look like open books, which I love since I’m a retired librarian. Thanks for the great giveaway. Rock Candy, Candy Dish and Giggles are my favorites! Please don’t make me choose my favorite!! I just can’t! Northern Lights caught my eye the first time I saw it, and it’s still my favorite; I’d love to make it for ME! I love the Hex N More Ruler! All of the quilts are ADORABLE, but if I had to choose, candy dish is my favorite! I love tiny dancer. It looks like such a complicated quilt. I love them all BUT Giggles just makes me smile :). Candy Dish simple and elegant pattern. 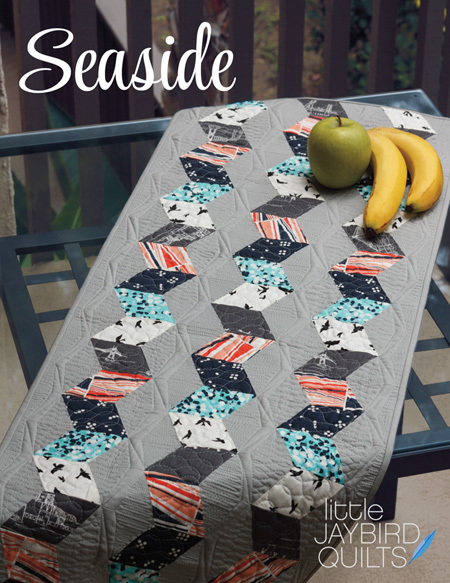 Whichever ruler will help me make the “Seaside” quilt is the one I would like to own! Thanks for the opportunity and creating rulers to make beautiful projects! I love your jawbreaker pillow! It provides a great way to showcase leftover bits of cherished fabric in a stylish way. What versatile rulers! Thanks for the giveaway! Next of your patterns I am going to make is Giggles. I can see it in so many other fabrics and color ways, and they’d all look great. I love Snack Time, because it reminds me of life savers and I love the shape of the rings. I haven’t used either ruler, but I have been itching to use the Hex n’ more ruler to make either Candy Dish, Toes in the Sand, or Tiny Dancer for a while now. I love them all, but Giggles is my favorite, followed closely by Lotus. I love all the patterns, but especially Science Fair. It brings back good memories of all the science fair projects my youngest had when he was in school. I also appreciate the tutorial, since sometimes I’m not sure I can figure out how to use new rulers. They both seem easy so I can hardly wait to purchase them. Love Candy Dish. But Giggles is also a close second. I think that Toes in the Sand would make a beautiful quilt, but love them all. Rock Candy is my favorite so far. But I say that everytime you come out with a pattern. Thank you for the giveaway. It’s hard to pick a fave with so many outstanding patterns! I’ll pick Science Fair since I’ve always loved hexies. Giggles is a close favorite due to the unusual setting of the diamonds. They are both great modern versions with traditional shapes. All the projects are wonderful, but when I came to “Giggles” it made me smile. 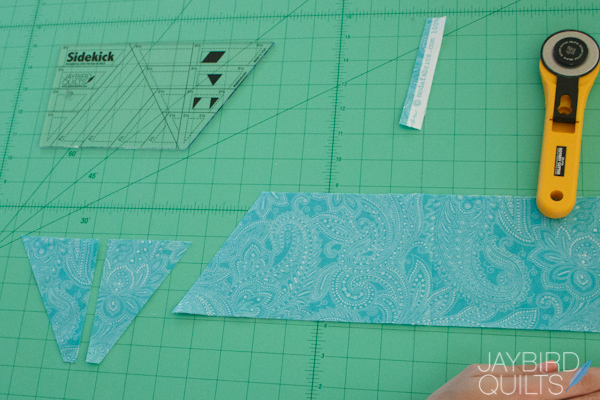 I would love to win and have a blast playing with all the ways to cut fabric. Thanks. I love Wonton and Rock Candy! Snack Time is my favorite!!!! Love it!!! I can see it in solids, or batiks, and even 30s fabrics!!! So many options that will have so many different looks! My favorite pattern is Wonton, love how it shows off the fabrics. I like “Toes in the sand” the most of all! I remember when you made it! I love the Rock Candy pattern…diamonds are a girl’s best friend plus I’m a hexie freak! The bright colors on the black background really pop! I love the new giggles pattern because I think it would make a great one for our charity quilt program. Oh I love the Northern Lights pattern with the Hex and more ruler. So sophisticated and graphic. I adore the Seaside pattern with the Sidekick ruler. The pattern looks like an accordion fold book. How fun is that? I love snack time and rock candy. The colors are so vivid and exciting. I would be so excited to win your rulers. They would make cutting so much easier. Thank you for the giveaway. I really like The Lotus pattern. It is so. Different than any other pattern I have seen. It has such movement. I like Science Fair best, both because the name rustles up all kinds of childhood memories, and because I think it would make an exquitite honeycomb/bee quilt, done in yellows and golds and creams. Love Science Fair! Its asymmetrical design appeals to me. Science fair is the one that is hitting me today. I think it could make a super cute quilt for my little guy. Science Fair for me too – it seems to strike a chord with so many of us. A great mix of traditional and modern. I love Science Fair cuz I’m a scientist and it reminds me of cyclic hydrocarbon rings. I like snack time. 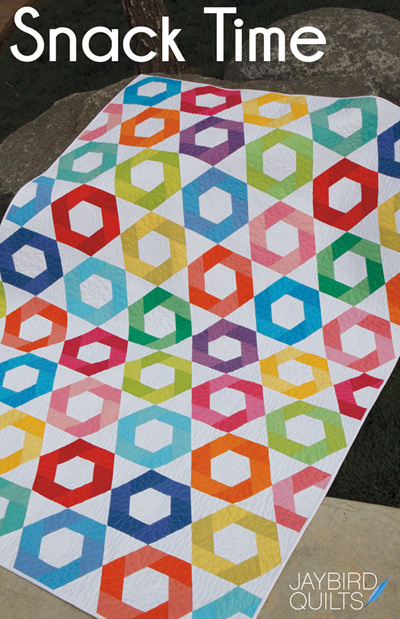 I love hexagon shapes, bright colors, and white so this quilt is perfect! I really like Science Fair. I like Snacktime. Love the layoutand all the colors. Makes me think of candy when I am looking at like a bag of gummy bears. Thanks for sharing. I have a hard time picking a favorite. I’ve made Chopsticks, Ballerina and am doing Toes in the Sand at a local quilt shop. My favorites are Toes In The Sand and Seaside. I like science fair! Its something scientific I can easily understand! I can’t decide between Rock Candy and Northern Lights. There are others I like too. Tiny Dancer is one of my favorites. Love “Toes in the Sand”! Wonton is my favorite. The more I look at it, the more different shapes I see. Several patterns appeal to me a lot, but if I can only pick one, it’s probably Science Fair. Thanks for this article, and for the giveaway. I really like Giggles, but I am fascinated by Rock Candy. I’d love tp try that! I live the science fair pattern. (And I have the ruler, so I should get to work on it! Congrats on your new ruler! i love the rock candy table topper it is stunning! I love Science Fair and Lotus – I purchased both of those patterns. I have not yet made them, but can’t wait to do so. I love seeing your booth at the shows, and love to see young people getting into the quilting world! Good Job Julie! I like the herringbone effect of the Tasty table runner. Very pretty! I am in love with the pattern Candy Dish. What can I say I like hexies! I’ve loved Northern Lights since I first laid eyes on it. Thanks for the giveaway! I love so many of these quilts! Tiny Dancer is one of my faves. Great rulers. 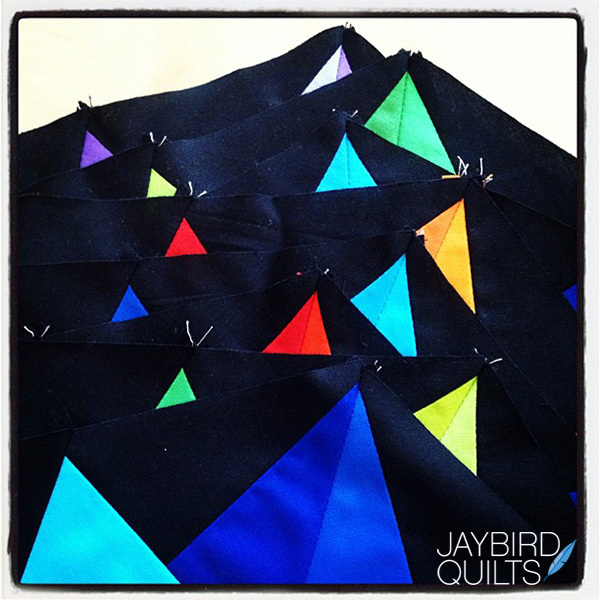 Jaybird Quilts are one of my fav designers. I love the modern sensibilities. 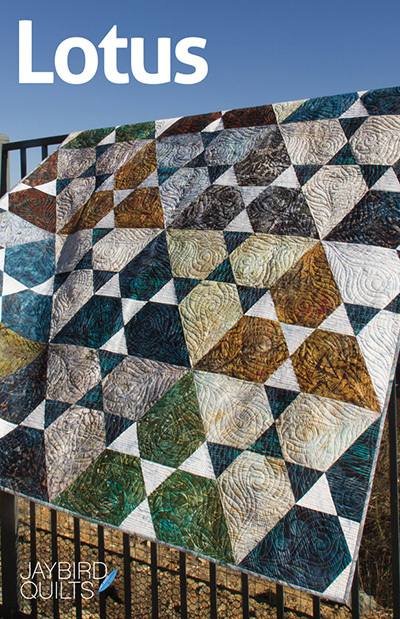 My favorite pattern is Northern Lights…It’s on my quilting bucket list! I love the Snack Time pattern! It seems like a great way to use small quantities of different fabrics. Look at all those rulers can do! I’d love to make the Rock Candy topper. I have it saved in my Etsy faves to buy very soon! Winning these would make it a no-brainier. I’ve seen some on Instagram using your hash tag chart (thanks for that!). It made it so easy. I love the “Candy Dish” pillows and how the white/colors are reversed in both. They look completely different from each other! It’s hard to pick just one! I think Science Fair is my favorite. They all look wonderful, guess I would start with giggles. Thanks for sharing. The Hex and More ruler is loads of fun to play with! I am anxious to try the sidekick ruler. Since I have made/or making a couple of the hex and more pattersn, I will pick Rock Candy and Giggles for your new ruler! Keep up the good work! Can’t wait to see your new things for market. Rock Candy caught my eye; thinking of various colorways to include in quilt blocks. Giggles and Seaside are my favorites. Thanks for the chance! Science Fair is my favorite, it is just striking. Love the Candy Dish Pillow Pattern! Love the shapes and colors you used and would love to win a ruler! I love Snacktime. All the bright agencies just make me smile! My favorite is Candy Dish. I have really been into stars a lot lately and these stars are just perfect. I really like the Candy Dish pattern. It’s amazing how you can get two totally different looks from just inverting the fabric choices. Thanks for the giveaway! It’s so hard to choose just one but it’s a tie between Lotus and Tiny Dancer. Have wanted the Hex N More ruler for so long and now want the Sidekick too. Hmmm… Science Fair? Toes in the Sand? Snack Time? And then there are those adorable Candy Dish pillows! Hard to choose! Hex N More would be my first choice for ruler. I have your Traffic pattern on my to do list, but see several others here that could hel keep me out of trouble over the winter months. I really like Snack Time or Rock Candy. They are all wonderful! Your patterns are so neat! Really beautiful! My favorite is Rock Candy. I love it because it reminds me of a blooming flower. Thanks for a great giveaway. scrappy quilt. Thanks for the chance to win! Really as I was sliding down the screen as each design was displayed I was thinking THAT one was my favorite! Since you asked though for one – I’ll pick Science Fair. It has a lot of space without a design that would be fun to FMQ! Thanks! I love Tiny Dancer. It’s so funky and original. I have two favourites – Northern Lights and Candy time. I really love both. It’s hard to choose, but I think I like Rock Candy best. I love Giggles! Everytime I see it, it makes me smile! How can I choose one favorite among so many? Let’s say Toes in the Sand, since I’m working on the Block of the Month right now. Thank you for a chance to win! They’re all really wonderful patterns but Seaside is my absolute favourite. Thanks for the chance to win. Love what youve done with Lotus, both the colourways and the design layout. I tried earlier this year to buy a HexnMore online but never did manage to get the link to accept my Paypal and was really disapointed to find nowhere in the Uk that sold them for you either? I looked at Knitting & Stitches show in Harrogate, Yorkshire last winter too but was disapointed not to find the HexnMore there. These look such useful additions to a stitchers life! I love the rock candy pattern. Can’t wait to try out these rulers. Tiny Dancer fascinates me! I love the movement the little triangles create. I love rock candy. The colors make it pop out, and the star design is one I like. I was immediately drawn to SEASIDE! But all your designs are interesting to me. I’d love to make the Toes in the Sand quilt, I’m fascinated by triangles but not yet had the courage to sew with them! Science Fair is definitely my favorite. Must be because I’m an engineer! I love science fair! We are a family of science geeks! thanks! Candy Dish, Lotus and Tiny Dancer are my favorites! I can’t choose just one. I love quilting rulers! I am always looking for new tools to make my quilting projects faster and better. These rulers belongn in my collection. My favorite pattern is Snack Time! I love the shapes along with the bright colors off set with white. It is simply stunning! Hmmm, Science fair is one of my favs. Lotus is another. Thanks for the giveaway. I love the hex ruler. Makes things look so simple to do! I also love the candy dish pattern. Truthfully, I love all the patterns shown. I’m going to have to find time to just play again! I love the Rock Candy your colors in this block is amazing. Thank you for giving me a chance to win. I love giggles it looks fab in those bright colours but I can hear a liberty print version calling to me! I love Candy Dish because of the combo of hexie .and triangle…also Science Fair because it is hexie heaven. 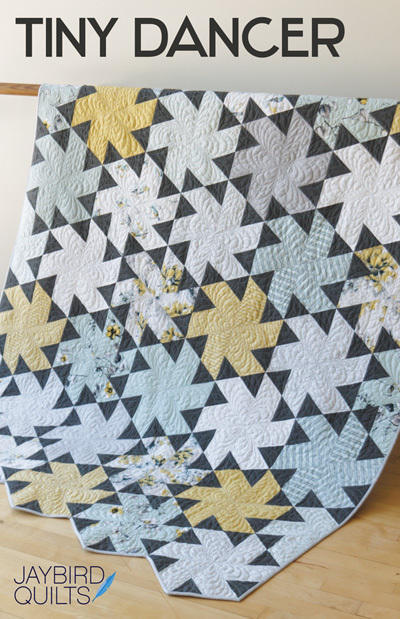 I love Tiny Dancer – would look great featuring a collection or as a totally scrappy quilt. I really like the Northern Lights. I love the design and the colors used really makes it POP! I love Toes in the Sand. It is on my to do list. Tiny Dancer is my favourite because I think it is a good one for featuring favourite fabrics. Wonton because it just looks fun! Thanks for the giveaway! My favorite is the Rock Candy because it reminds me of looking in a kaleidescope. ( I hope I spelled that correctly!) Thank you for the chance to win one of these fabulous rulers! 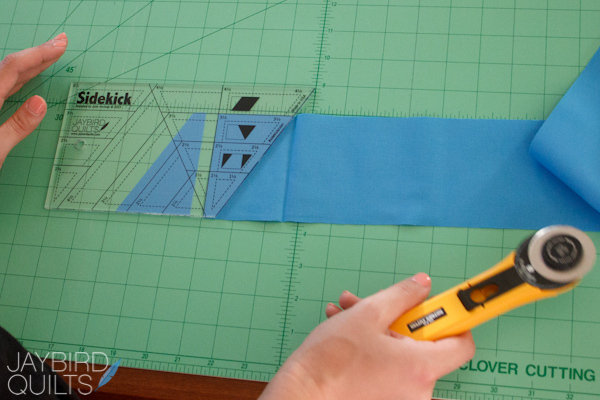 Luv the new sidekick ruler for cutting diamonds and triangles! I love all of your patterns but Rock Candy really stands out for me, perhaps because I love the colors you chose. 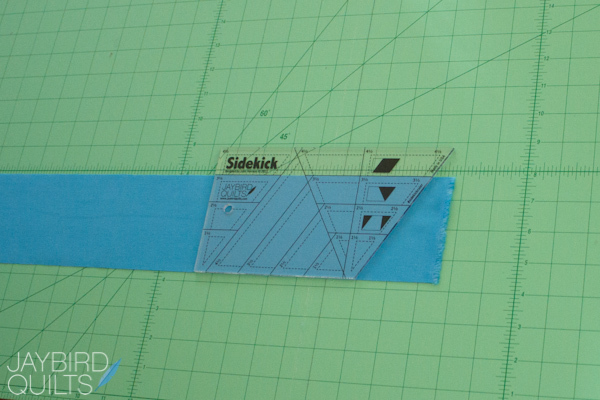 The sidekick ruler is my favorite to have so many options for blocks. Love your designs, you have inspired me. Love all the patterns from these rulers. I thought I had enough rulers, but I see I need more. I love Tiny Dancer. The edge is so fun, and I love how the tiny triangles pop in the pattern. I have made Lotus and Wonton but really love Tiny Dancer. I have been admiring the Tiny Dancer paatern for quit awhile now. It so intersting and would so pretty in greay and yellows! Love Northern Lights. I think the zig zags and color appeal to me the most. I love the Lotus pattern. I actually purchased it for a friend. Would love to win the rulers! Thanks for the giveaway!! How ingenious. Thanks to those who make quilting an even better event. Love all the patterns. I’m keen to make parallelograms also have a thing for hexies. Oh, gosh, I can’t just pick one! LOVE LOTUS, SNACK TIME and TINY DANCER!! Can’t wait to try your new rulers – very cool! My favorite is Snacktime! Thanks so much! Toes in the sand is my favorite, it’s on my list of must makes! I love the Rock Candy pattern. Stunning! Your rulers are wonderful! Snack time—I can see little embroidery pictures in the centers…so cute! Neat ruler!! I have loved the Toes In The Sand pattern since I first saw it, in fact, I just ordered it and the Hex n More ruler last week! I could sure use the Sidekick ruler though! I love the seaside table runner, I just made one and I love it!! I made my own quilt pattern using the hex n’more and I love how that turned out. Giggles is my favorite. I think I really need these rulers. I think that Rock Candy, sewn with holiday colors, would make a lovely tree “skirt” for my mother’s ceramic Christmas tree. I seem to be on a pillow kick lately and I am loving these pillows! Jawbreaker caught my eye right away with the hexagons. Love them!! Thanks for the chance to win! Love the Candy Dish pillow pattern. I’ve been looking for a small project to start and this is perfect. I love all the designs, but if I have to pick a favorite it would have to be Jawbreaker. I’m so into the hex’s right now. I love northern lights! They’re all fabulous though and this looks like a fun ruler to play around with! i’m guessing I’d make LOTS of pillows! I love the candy dish pattern, but there are several here I would like to try. I guess I need more rulers!!! Tiny Dancer and Candy Dish caught my eye. I like the interest in Tiny Dancer. Would love to try the rulers. Thank you for the giveaway and for your pretty designs. So many great patterns, but I particularly love Toes in the Sand. Patterns are interesting to look at & ruler looks like it makes it easy. Would love to win. Love your patterns and the rulers! Also love the hash tag right on it! I like Science Fair because it doesn’t have straight edges. I love the Jawbreaker pattern, it is great in the pillow. Thanks for the giveaway. I like that Tasty table runner! It is hard to choose one as they all have so much visual appeal…I might start out with something small like Candy dish, Jawbreaker, or Rock Candy (is there a theme here? )but sometime I would love to take on Tiny Dancer – I saw one done at my LQS and it is stunning! Snack Time is my favorite because it looks fun to make with all the different colors. Snack Time – really like the solids. I just picked up the Candy Dish pillow pattern this summer and can’t wait to make it. I need to find your rulers somewhere though!! I like Tiny Dancer the best because it reminds me of pinwheels. Thanks! That’s a hard choice. I love stars so the Rocky Candy really appeals to me but I also love the movement in Tiny Dancer. I also love Jawbreaker. I haven’t made anything with hexagons so the pillow would be a good beginning piece to try. Rock Candy. Looks like a jewel. A whole bed sized quilt in it would be stunning. I like science fair… not sure why. Maybe because I have a little boy and there don’t seem to be as many patterns for them? Maybe because science is as important as art, and this marries the two in a very light hearted way! 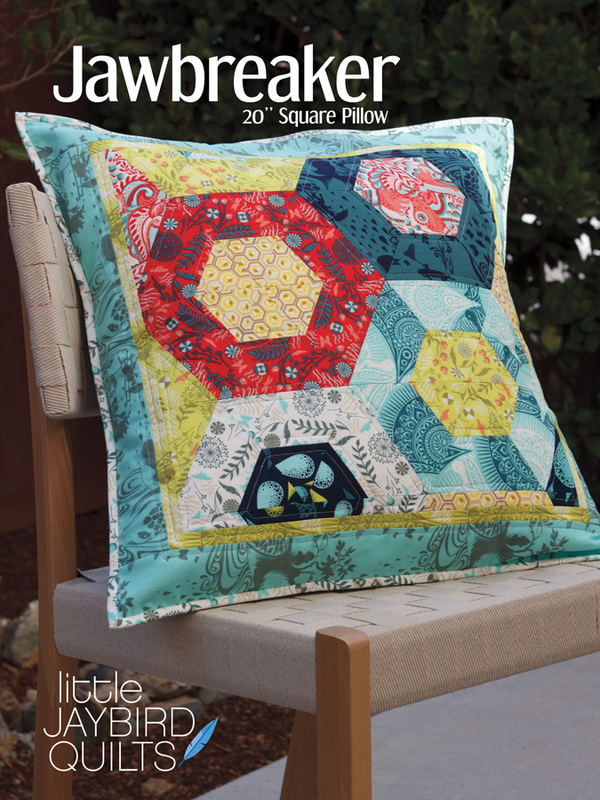 I love the Jawbreaker pattern….I love the hexies and I love pillows…this is a beautiful pillow….thanks for the giveaway..
My favorite is science fair! It’s so fresh and different. Love your new sidekick. I love the movement in the Tiny Dancer pattern! I love Candy Dish, followed by rock candy: can you sense a theme here? Those rulers look fantastic: I’ve been looking at them for the last year!! Thanks for the chance!! I’m married to a scientist, so of course I have to say Science Fair!! Rock Candy is my favorite. Love the look of Wonton! Hard to pick just one, but Science Fair is at the top on my list. Love how it is not symmetrical. You are very creative! I would make Science Fair with my stash of thirties fabrics. My favorite patterns are Tiny Dancer and Rock Candy. I have two favorites – science fair and northern lights! Love Giggles. My Granddaughters will too. The Candy Dish pillow pattern is so cute – love pillows! Your ruler is great! Absolutely love the Science Fair. I looooove Snack Time the best…such cheery colors used…and is just fun! Wonton is close second…love the triangles. AWESOME quilt ideas! the instructions make the rulers look so easy to use! I really like Jawbreaker, I have a thing for hexagons! I love, love, LOVE Candy Dish. You can’t beat hexagons and stars! I love both tools but I would especially like to make Rock Candy. It’s beautiful and I appreciate anything that helps my hands be creative. I have your hexi template now and see you have another! would love to win it and start experimenting with it for color and form! wow! Science Fair! I love the way the edges are finished! sidekick ruler. I like the different triangles you can cut. I actually like them all! These patterns are so modern and cool! My absolute favourit is the Northern Lights Quilt though! The colors are stunning and I love the wonky zig-zags! Great work! I like the Tiny Dancer pattern! I think Science Fair is a favorite. Its one the men in my family can relate to 🙂 I’ve been wanting to get this ruler to make a jewelled pattern for a pillowcase. Hope to get around to that soon. Thanks for the chance to win! I think Science Fair is my favorite- love the edges! I can’t make up my mind between Lotus and Tiny Dancer! Lotus looks exotic and the colours and quilting are fantastic! Tiny Dancer makes me feel happy and no one would believe it was made from half hexagons. It looks too complicated!! Science Fair!! Why? Because I’m a science geek. I have a background in organic chemistry, and the hexagons remind me of benzene rings. Just bought the Hex N More ruler, going to use it to make a quilt for my step mom for christmas, would love to have the sidekick as well. 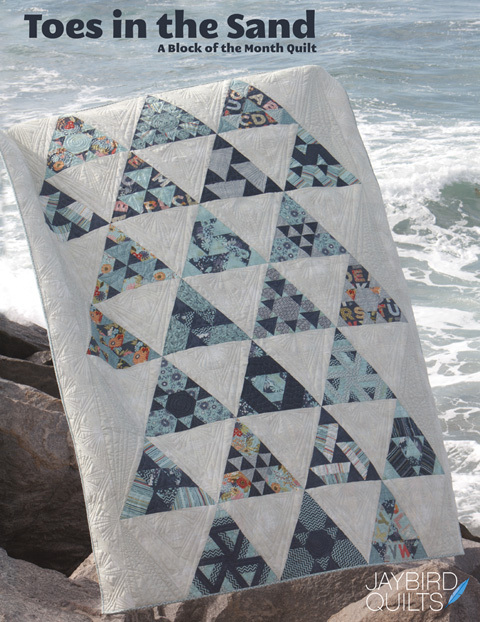 Love all the quilts on the website, Beautiful! Great work! I love the Candy Dish pillows. Pick a favorite? Now there’s a challenge. The best I can do is to pick 3. Giggles- I like all the smiles I see. Toes in the Sand- Learning to use the tool and not be bored with the same block over and over. Northern Lights- Patterns that can be pieced with solids and not look pieced are hard to find. Great to find tools that can do more than one thing. 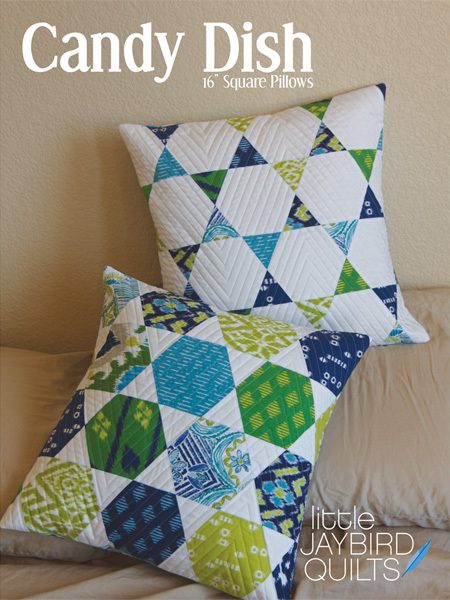 Love the Tine Dancer quilt and the Candy Dish Pillow with the straight line quilting. Tiny Dancer is probably my favorite. I love the spinning look of the quilt and it makes me think of my tiny granddaughter who loves to spin and dance. Thanks for the tutorial and the chance to win these rulers. Northern Lights! It has such a dramatic effect just like when viewing the Northern Lights. Thanks for promoting your products for newbies like me to find! I like Science Fair the best. Depending on the fabric used, scrappy or not the hexagons would be really fun. Plus, I love the negative space. Love Rock Candy. Really striking. Thanks for the chance to win. I love Northern Lights! 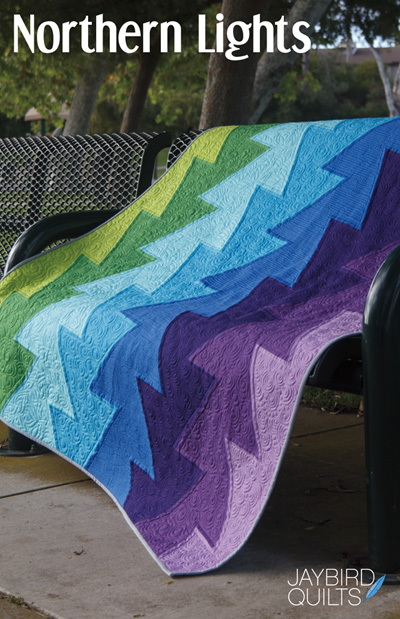 The potential color choices and combination of free motion quilting is mind boggling. It has the potential to look like a tiered garden, a mountain range,a troposphere, stratosphere or mesosphere. Wonderful variety of designs and your directions are very clear too. Since you ask for just one favorite, I’m drawn to Toes in the Sand. I like the variety in the design pieces and the spaces with the alternate blocks – good way to show off some FMQing. Thanks so much for putting my name in the hat for your drawing! I really like the “Tiny Dancer” pattern! They are all good looking quilts. I just love these patterns! Can’t wait to start Toes in the sand and finish up science fair. THe new one giggles is perfect for the birth of the up coming TRIPLETS! (Perfect name for baby quilts as well). It was really had to select which one I liked best they are all great, but if I have to select one it would be Snack Time. I love the colors it is so cheerful. Science fair is my favorite! I love Snack Time and Rock Candy! I like the designs and how they can be used with any fabric. 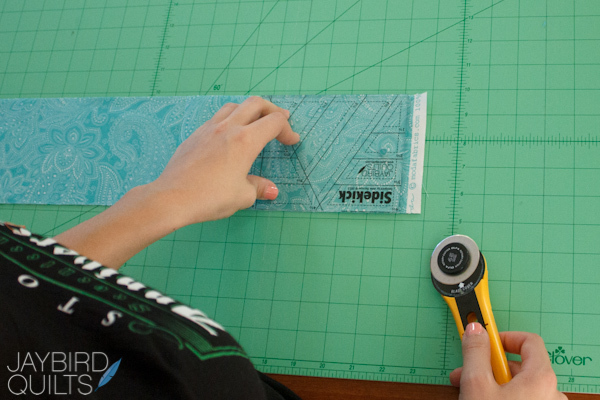 I would love to win a set of your rulers … thanks for the chance! I like the diamonds in the Rock Candy table topper. What can I say? Diamonds are a girl’s best friend! I like the Giggles pattern, it’s simple but would do a great job showing off a wide variety of fabrics and quilting styles. Although they are all wonderful patterns – Lotus struck my fancy with the different shapes and fabrics. I love giggles….which I bought…I also bought the Hex N’ More….if I was lucky enough to win, I’d give the extra Hex N’ More to my quilting friend who moved to Florida!!! Love these!! I love the rock candy, it is lick-a-licious. thanks for a chance to win. 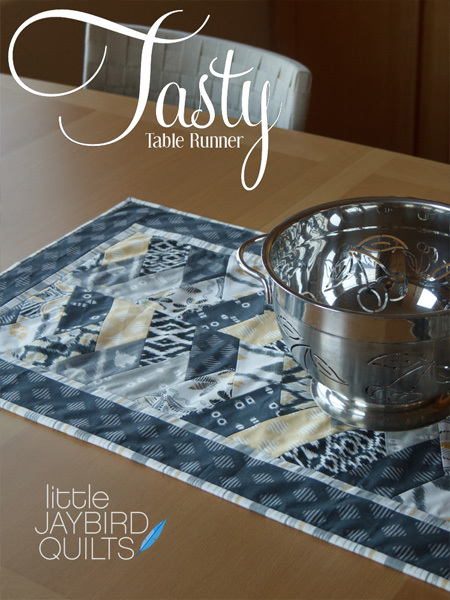 Candy Dish and Tasty table runner are my favorite patterns! I’ve wanted a ruler like this for a long time! Northern Lights and Toes in the Sand are my favorites. The rulers look so handy. I love Toes in the Sand. It was hard to pick out of so many wonderful designs but this is just what I would want to make right now. I like Ties I the Sand because you can show off beautiful fabric and beautiful quilting ! I just love the Northern Lights pattern. It just speaks to me 🙂 Thanks for the chance to win. Such cute patterns and what a great tool!! I like Tiny Dancer, Rock Candy and Candy Dish. Great tutorial Thanks! Northern Lights caught my eye right off. I just made a lot of Rock Candy. Loved the pattern. So much fun, but my mom owns the SideKick Ruler and all the patterns to go with it. It would be nice to have my very own! What a great ruler. It would be a wonderful addition to my collection. Fun and easy to use. Love Rock Candy. Very striking. I love Rock Candy! By the way, love the Hex N More ruler — I bought it while traveling at a lovely quilt shop in Morgantown, WV. So happy to see the patterns and even more ideas for how this great tool can be used. Would love to have the sidekick too! Northern Lights is my favorite because you can get great effects with fabric variations. And it is easy to pt together. These ruler/templates look great! I have been bitten with the hexagon bug and would love to try these. I especially like the Tiny Dancer pattern. Thanks for sharing. They all look neat but Rock Candy would be fun to make! I really like Toes in the Sand.i have the Sidekick ruler and really need the Hex No More Ruler too. I look at that HexNMore and just see so many possibilities…. I love candy dish! They are all real pretty! I love the symmetry of Rock Candy and the intrigue of Lotus! Thank you.